Riders Manual in PDF so you can store it on your smart phone! I cannot attach the PDF as it is to big so you can down load it from the link below. 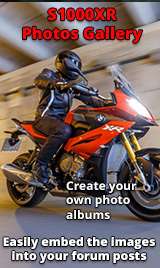 Goto Service & Maintenance then Riders Manual then expand S models to show S1000XR and download to your PC. I think it's easier to keep the hard copy you get with the bike in your tank bag. You can obviously carry the hard copy but it is handy as a backup to have it digitally on your phone, I also have on my phone the digital versions of the operator manuals/user guids for my Navigator V, Garmin Virb camera, Sena BT headset and Biketrac. You would struggle to get these all under the seat!